Today is Independence Day in the Philippines. It’s the day we Pinoys commemorate the day when total autonomy, liberty and freedom of our country against foreign rule was declared. It is also one of those days of the year when Pinoys would discuss on who should be the country’s National Hero. Some recognize that it is Rizal, some agrees that it is Bonifacio, some opines that it is Aguinaldo while others rant that it is the father of Kris Aquino. But today let me personally mark my respect to one of the understudied men responsible in providing me freedom. He is Apolinario Mabini, the guy whose name was adopted by a popular singing Pinoy trio two or three decades ago. A lot of people including myself have high regard to people with soaring intelligence. 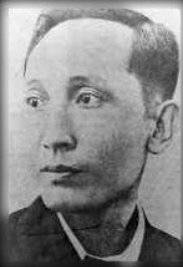 Apolinario Mabini is one of those few Pinoy personalities. I like this dude because he lived a humble life and his existence were not laced with issues and controversies of motives of self interest (like that of Bonifacio, Aguinaldo, Aquino and even Rizal). Today being Pinas’ Independence Day let me allow everyone who stumbled upon this write-up to sink his or her teeth onto Manong Apol’s genius writing entitled The True Decalogue. First. Thou shalt love God and thy honor above all things: God as the fountain of all truth, of all justice and of all activity; and thy honor, the only power which will oblige thee to be faithful, just and industrious. Second. Thou shalt worship God in the form which thy conscience may deem most righteous and worthy: for in thy conscience, which condemns thy evil deeds and praises thy good ones, speaks thy God. Third. Thou shalt cultivate the special gifts which God has granted thee, working and studying according to thy ability never leaving the path of righteousness and justice, in order to attain thy own perfection, by means whereof thou shalt contribute to the progress of humanity; thus; thou shalt fulfill the mission to which God has appointed thee in this life and by so doing, thou shalt be honored, and being honored, thou shalt glorify thy God. Fourth. Thou shalt love thy country after God and thy honor and more then thyself: for she is the only Paradise which God has given thee in this life, the only patrimony of thy race, the only inheritance of thy ancestors and the only hoe of thy posterity; because of her, thou hast life, love and interests, happiness, honor and God. Fifth. Thou shalt strive for the happiness of thy country before thy own, making of her the kingdom of reason, of justice and of labor: for if she be happy, thou, together with thy family, shalt likewise be happy. Sixth. Thou shalt strive for the independence of thy country: for only thou const have any real interest in her advancement and exaltation, because her independence constitutes thy own liberty; her advancement, thy perfection; and her exaltation, thy own glory and immortality. Seventh. Thou shalt not recognize in thy country the authority of any person who has not been elected by thee and thy countrymen; for authority emanates from God, and as God speaks in the conscience of every man, the person designated and proclaimed by the conscience of a whole people is the only one who can use true authority. Eighth. Thou shalt strive for a Republic and never for a monarchy in thy country: for the latter exalts one or several families and founds a dynasty; the former makes a people noble and worthy through reason, great through liberty, and prosperous and brilliant through labor. Ninth. Thou shalt love thy neighbor as thyself: for God has imposed upon him, as well as upon thee, the obligation to help thee and not to do unto thee what he would not have thee do unto him; but if thy neighbor, failing in this sacred duty, attempt against thy life, thy liberty and thy interests, then thou shalt destroy and annihilate him for the supreme law of self-preservation prevails. Tenth. Thou shalt consider thy countryman more than thy neighbor; thou shalt see him thy friend, thy brother or at least thy comrade, with whom thou art bound by one fate, by the same joys and sorrows and by common aspirations and interests. Therefore, as long as national frontiers subsist, raised and maintained by the selfishness of race and of family, with thy countryman alone shalt thou unite in a perfect solidarity of purpose and interest, in order to have force, not only to resist the common enemy but also to attain all the aims of human life. This masterpiece is so significant and is substantially applicable up to this date. It seems that this composition is breathing and has a life of its own. I hope that this is discussed to all young students of this present “free and independent” generation. No wonder, American General Arthur McArthur (not Douglas) is so impressed with this dude, that he acknowledged him as a true Malay genius with views that are far more comprehensive than any other living Pinoy of his time. I’m pretty sure if Mabini is living today, he would have been one damn great blogger! Ipapalow ko din ang Tweets nya kung nagkataon!